Today, Dr. Matt Chingos of the Urban Institute released a new study that shows very favorable long-term outcomes for students who enroll in the Florida Tax Credit Scholarship Program – the largest private school choice program in the country. 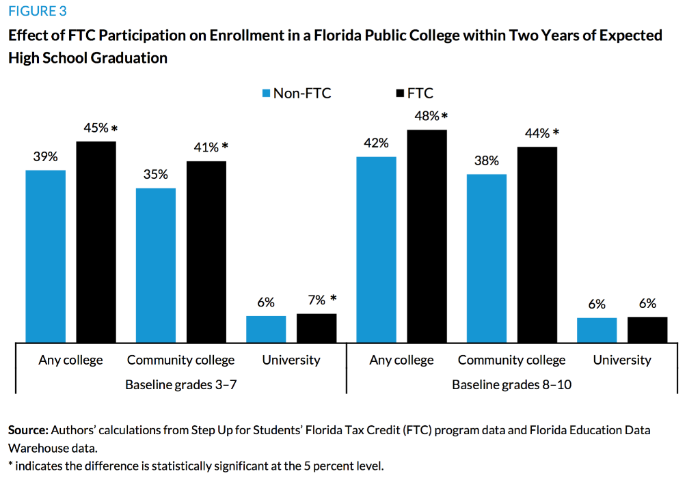 The results are clear: the Florida program significantly increases college matriculation, especially when students were enrolled in the FTC program for a longer period of time. – On average, the FTC increases college enrollment by 15 percent compared to public school students who did not receive a scholarship. If a student stays in a private school via the FTC for two years, college enrollment increases by 9-14 percent compared to public school students. If a student stays in a private school via the FTC for three years, college enrollment increases by 19-25 percent compared to public school students. If a student stays in a private school via the FTC for four years or more, college enrollment increases by 37-43 percent compared to public school students. – Also, if students received a scholarship from the FTC in grades 3-7, and stayed in the program for four years or more, they saw modest improvements in associate degree attainment rates. 68 percent of the students are Black or Hispanic, the average family income for students in the program is $25,000, and research shows they were some of the worst-performing students at their previous public school.